If you connect with us on our social media channels – Instagram, Twitter or Facebook – then you know I (Lisa) adore trying out new skincare products to keep you abreast of the good, the bad and the dangerously ugly in terms of toxic ingredients and their associated health risks. The average woman uses 9-12 products containing 168 unique ingredients every day. Men use 6 products daily with 85 unique ingredients, on average. In Europe 1,100 ingredients are regulated or banned from skin care products. In the U.S., only 11 ingredients are regulated in skin care. Perfumes alone are found to contain up to 400 different ingredients. Less than one percent of all cosmetic products are made from ingredients that have all undergone safety assessments. The Environmental Protection Agency (EPA) has only tested about 200 of the 84,000 chemicals on the market. We’re talking personal care products laced with dangerous cancer-causing and hormone-disrupting types of nasties including: aluminum, parabens, formaldehyde, toluene, sodium lauryl sulfate, propylene glycol (PG), synthetic fragrances and lead that you use EVERY. SINGLE. DAY. So, let’s recap. We should spend money on artificial fragrances and colors, synthetic preservatives, heavy metals, toxins and an ingredient used in antifreeze and brake fluid to make us look and feel younger and more beautiful? My recommended skincare products must adhere to strict standards and be truly healthy; certified organic (when possible), natural, free of chemical preservatives and artificial ingredients and be cruelty-free. This of course, instantly diminishes the selection of choices. But, it’s not more choices we need, is it? It’s quality. 60 percent of what you put on your skin is absorbed directly into your bloodstream and circulated throughout your body. What if I told you a brand that possesses all of the above actually exists? What if I told you it’s also affordable? 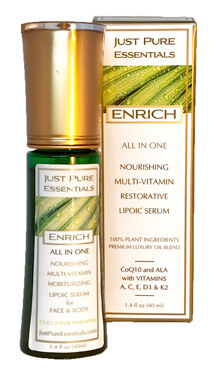 I am thrilled to introduce you to a skincare line that is made with 100 percent vegan, natural and edible plant ingredients called Just Pure Essentials. Portion of sales are donated to various charities around the globe. Gals, this line shouldn’t be reserved for just you. Share the healthy love with you partner, hubs, bae – or – even your mom, sister or friend. After all, love is meant to be spread. This all-in-one line is artfully crafted with exotic plant oils and medicinal herbs and can be used alone or in combinations to suit your needs. In addition to skincare, the line consists of an edible moisturizing and massage oil called, JUST Love, in delicious natural organic fruit flavors. JUST Love is made with premium coconut MCT oil blend (I had to ask, too). MCT means Medium-chain Triglycerides from cold pressed Coconut Oil. Because of the smaller molecular structure and bio-compatibility, MCT is readily absorbed into your skin. Plus, JUST Love oil also consists of argan, green tea, shea and French plum of the finest quality from around the world. After all of that detoxing, I nourish my skin with the award winning, ENRICH. This all-in-one oil is a bottle of liquid gold. 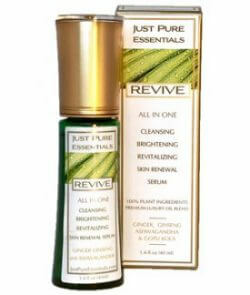 It packs a punch with multi-vitamins and lipoic serum. It feels like heaven on your skin; light and silky without a heavy, greasy feel. It’s chock full of antioxidants, essential fatty acids and vitamins that will keep your skin youthful, vibrant and elastic while reducing fine lines and wrinkles and those oh-so annoying crow’s feet. And then, there’s REVIVE; the brightening and renewal serum that’s packed with ginger, ginseng, ashwanghanda and gotu kola which is especially good for dry, dull and mature skin (not that any of have that, wink, wink!). In fact, REVIVE was just awarded Best Serum of 2018 for the fourth year in a row. Good for you inside and out. They built a company that honors health, protects the planet and gives back. The duo acknowledges that optimal health, longevity and a youthful appearance shouldn’t be taken for granted, rather, consistently earned. We agree! If you’re a stay at home parent, or even just looking to supplement your income – you’ll also enjoy the fact that this can be a full-time or part-time business since it offers a direct sales opportunity. You can educate your loved ones about the numerous benefits of pure, natural, healthy skincare while earning extra revenue. Just click below to learn more about this opportunity or to join the team! You are what you eat. So, don’t be fast, easy, cheap or fake. The same holds true for your skin. It’s time to switch to plant-based skin & body care products that are safe enough to eat and made with quality ingredients. Let’s leave heavy metals and antifreeze to automobiles, shall we? Feed your body and it will feed you. 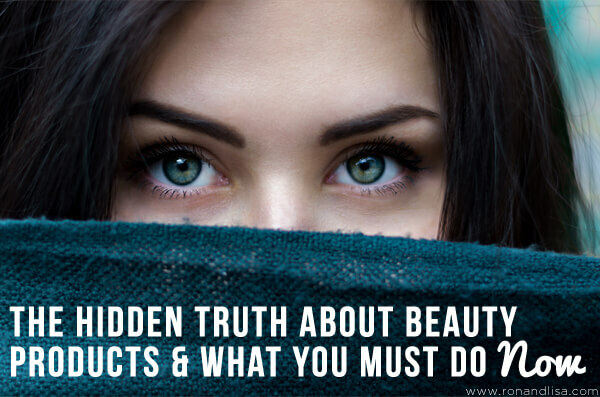 Turns out, beauty isn’t just skin deep after all. Hi Jack & thanks for dropping by! I would also suggest for you Enrich, Protect- for dry chapped lips and hands, and Soothe Reveil for for shaving/after shave/moisturizer. Your wife will love everything! You both should consider ‘PURE LUXURY Kit’ as it has one of each product with a 10% discount and free shipping- a great way to get introduced to the line and enjoy it all! Let us know if you have any questions. We’d love to hear your personal feedback, so feel to drop back here and let us know how you like the products.